Hop aboard and go for the ride of your life with Disney toy trains. 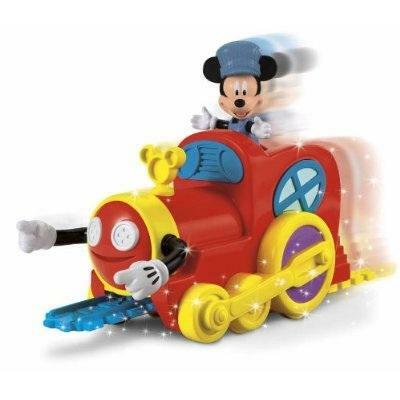 What little boy -- or girl -- wouldn't love a train set powered by Mickey Mouse or any one of his Disney pals? There are several from which to choose, and they are available at various toy or hobby store and retail locations. Disney has toy trains available for children -- and adults -- of all ages, from simple ride-ons for toddlers to die-cast replicas of real locomotives for the older ones. Here is a sampling of the different styles available. Mickey's Magic Choo Choo: From Fisher Price comes this delightful kiddie train made for youngsters three to six years old. In Classic Mode, Mickey engineers the train around a small oval track. However, in Magic Mode, the tracks are inside the train and they are put down and picked up as the train moves along. It plays a fun musical number and has a train whistle that blows. This train is based on the Mickey Mouse Clubhouse episode, "Choo-Choo Express". Classic Wooden Pull Toy Train: Designed for children 18 months and older, this choo choo is as simple as they come. The wooden train features painted-on characters such as MIckey Mouse, Snow White and the Mad Hatter. It has working wheels and a pull string. Disney Magic Ride Wooden Talking Railroad: This Disney train features Winnie-the-Pooh as the engineer of a colorful and talkative railroad. Made for children two and older, this train stops at three amusement park rides along the track. Walt Disney World Deluxe Monorail Train Playset: Go with Mickey Mouse as he pilots this replica of the Walt Disney World Monorail through the Magic Kingdom. It includes 14 feet of track, a working headlight and authentic Monorail sounds. It also comes with eight Disney characters: Mickey Mouse, Minnie Mouse, Donald Duck, Daisy Duck, Pluto, Lilo, Stitch and Goofy. Walt Disney World Resort Railroad Train Set: Join Mickey Mouse, Minnie Mouse, Goofy and Donald Duck on a ride with this fun working railroad. This plastic set comes with 18 feet of track and four connecting cars. It has a working headlight and puffing smoke. Magic Of Disney Express Electric Train Collection: For much older children, this limited edition model train set is available by subscription. This light-up railroad features a steam locomotive, steam tender and class train cars beautifully designed with all of your favorite Disney characters. This is a subscription, so your child will not receive the entire train at one time. Each time you purchase an issue, you will receive the next train car. The train comes with a free, 16-piece, On30 scale track and power pack. Walt Disney's Carolwood Pacific Railroad: From Bachmann Trains comes this one-eighth scale of the locomotive Walt Disney built in the backyard of his Holmby Hills, California home. Named Lilly Belle, after his wife Lillian, this steam railroad comes with a power pack, controller, working headline, boxcar, two gondolas, bobber caboose and tracks. Because of its intricacy and delicate parts, it is not for small children. If you have ever visited Disneyland or Walt Disney World, you know that taking a steam train ride around the park is a memorable experience. Create some of the same magic at home with a Disney toy train.